The Lindys 8.5 quart Dish Pan is great for camping and home use. The flat bottom makes it easy to fill to the brim without worrying about upsetting the balance while you are doing dishes. Also great for pet water and food bowls! 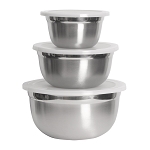 Durable, long lasting quality stainless steel will last your family for years.